EN-EFF training days - IMRO-DDKK Környezetvédelmi Nonprofit Kft. 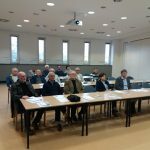 In autumn 2018, IMRO-DDKK Nonprofit Ltd. organized 3×2 days course in Zalaegerszeg, Pécs and Kaposvár on behalf of the Zala County Foundation for Enterprise Promotion, Somogy County Entrepreneurship Center and Pécs-Baranya Chamber of Commerce and Industry. The training is one of the main activities of the New Training Concept for Energy Efficiency project, which funded by INTERREG V-A Hungary-Croatia Cross-Border Cooperation Program. The main goal of the project is to contribute to building nearly zero (nZEB) energy-intensive buildings with different teaching materials, trainings and professional trainings. In addition to the excellent experts, the success of the training is also due to interactive learning.